"Rain" is a song by the English rock band the Beatles, credited to Lennon–McCartney and first released in June 1966 as the B-side of the "Paperback Writer" single. Both songs were recorded during the sessions for the album Revolver though neither appears on that album. 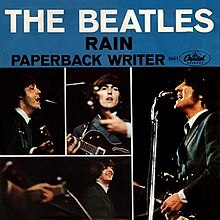 Written by John Lennon, "Rain" has been called the Beatles' finest B-side, noted for its slowed-down rhythm track and backwards vocals, both of which were a hint of things to come on Revolver, released two months later. Three promotional films were made for the song "Rain". These videos, along with other Beatles videos at the time, sparked George Harrison to say during the Beatles Anthology, "So I suppose, in a way, we invented MTV." In America it was rumored that Rain was about a nuclear war, and that rain signified nuclear dust, or fallout coming down. I thought it was a great song, even though I didn't believe the rumor.